Garrison Vieira/West Tisbury Police Dept. The fire raged at Flatpoint Farm in West Tisbury. 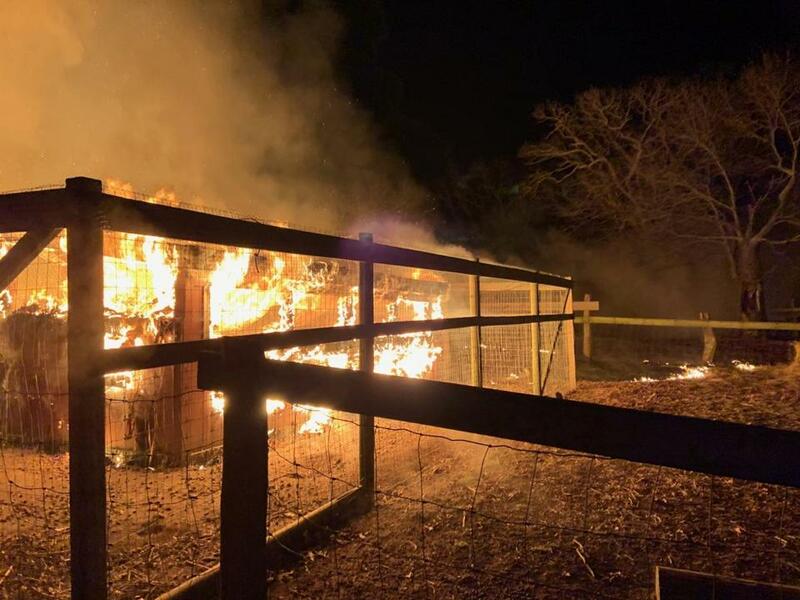 Martha’s Vineyard residents on Wednesday were mourning the loss of 86 animals, including lambs just weeks old, killed in a large barn fire at Flat Point Farm in West Tisbury. The three-alarm fire, apparently sparked by a heat lamp that ignited with bales of hay, broke out just after 5 a.m. Tuesday, and drew several island fire departments to the 80-year-old farm. The fire was reported by a resident of a rental property on the farm, who said she could hear crackling from the wood-framed barn, according to police and fire officials. By the time firefighters had arrived at the northeast edge of the 97-acre property near Tisbury Great Pond, two young cows, 12 sheep, 22 newborn lambs, and 50 laying hens had died. Crews worked for five hours to salvage the equipment in a neighboring barn and douse the 500 bales of hay from the main barn to prevent sparks, West Tisbury Fire Chief Manuel Estrella III said. “They’re an established farming family so it’s just a tragic [situation],” Estrella said. Estrella said he is not calling for an investigation because he is confident the heat lamp used to keep small animals warm caused the fire. “The problem was there were 400 or 500 bales of hay in the same barn,” Estrella said. The barn was originally built for a dairy farm by the late Arnold Fischer Sr. in 1939 when he bought 26 cows. Since then, it’s become a cattle, sheep, and chicken farm, said owner Arnie Fischer Jr., 62. He became emotional in a phone conversation discussing the lambs especially, who were all born on or after March 5. His daughter, Emily, runs the farm operation now with her husband Doug and two boys, Milo, 9, and Leon, 6. Emily Fischer oversees the 30-acre hay field and makes goat milk soap, which she sells at wholesale and at local farmers’ markets, Fischer Jr. said. Arnie Fischer’s house is a half-mile from the main barn that burned down, but his niece lived closer to the scene, which ended up helping firefighters battle the blaze. “[She] lives on property in the main farm house [with] her two children. Her husband is a fireman, Marcus Rivers, [so] he was the first one on scene,” Fischer said. Fischer said he is overwhelmed with the generosity of the local community and other farmers nearby. “Calls, e-mails, texts. People wanting to help. Heavy equipment or carpentry, people offering whatever they can do. People brought donated hay for the remaining animals,” Fischer said. No people were injured, and three pregnant cows and all the goats from another shed escaped harm. Correspondent Andrew Stanton contributed. Sabrina Schnur can be reached at sabrina.schnur@globe.com. Follow her on Twitter @sabrina_schnur.